AAPL stock has reacted to Monday's Apple Event news pretty much like the tech media did – with a big yawn. Apple Inc. (Nasdaq: AAPL) stock closed Monday at $105.91, just one penny lower than Friday's close. At an event on its Cupertino, Calif., campus, Apple unveiled the iPhone 5SE, a 4-inch iPhone with most of the innards of the latest flagship models, the iPhone 6S and iPhone 6S Plus, but a much lower $399 starting price. Apple also introduced a 9.7-inch iPad Pro to join last year's 12.9-inch model and trotted out some new Apple Watch bands while dropping the starting price on that device by $50 to $299. If anything, it looked like Apple had confirmed what its critics had been saying since last fall – that the iPhone had peaked, and the days of robust growth were over. The price drops for the Apple Watch and iPhone 5SE – which has the lowest starting price of any new iPhone – seemed to prove that Apple is getting desperate. That story line suggests Apple stock would slump as investors digested the news. But AAPL stock has moved sideways this week. Apple shares rose 0.76% on Tuesday, to $106.72. On Wednesday, the AAPL stock price edged down 0.55%. Investors decided the Apple Event news was of little importance. But that assessment greatly underestimates Apple's plans. What the company did on Monday is part of a grand strategy that will boost earnings more than people think. It's rather odd that the reaction to the iPhone 5SE hasn't been more positive. After the all, the biggest concern about Apple stock for the last six months has been the lack of iPhone sales growth. The iPhone SE addresses that concern directly. Here's a phone on par performance-wise with Apple's best, but in a smaller form factor and a much lighter price tag. And Apple did it the smart way. By re-using tech developed for the iPhone 6S, in addition to the older, less expensive 4-inch displays, Apple won't take that much of a hit on its profit margins. Upgrades from the 16GB version to the 32GB version of the iPhone 5SE will also help the margins, since about 80% of the difference in price is profit. 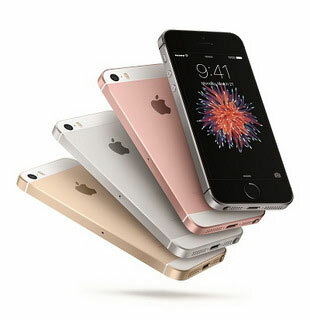 Sales-wise, the iPhone SE will attract some customers in the United States and Europe who prefer a 4-inch screen, which have become very scarce in the overall smartphone marketplace. But the real target is China and India, the two markets experiencing the most smartphone sales growth right now. While China has proven that customers capable of paying more for an iPhone will do so, a lower-cost version should draw more customers. India is a less mature market, which means more growth opportunity, but its middle class is less than a quarter of the size of China's. So the iPhone 5SE expands Apple's total addressable market there. Some critics believe the iPhone SE will flop in China and India because of a consumer preference for larger screens in those markets. But that ignores the powerful lure of Apple's aspirational brand at a more affordable price. Remember, too, that the iPhone 5SE is Apple's second swing at moving into the middle-tier smartphone market. Whatever the company learned from the disappointing iPhone 5C it applied to the market positioning of the iPhone 5SE. In a rare instance of clarity for a Wall Street analyst, Rod Hall of JPMorgan Chase & Co. (NYSE: JPM) called out his peers for missing the implications of Apple's iPhone 5SE strategy. "Apple just opened up a substantial iPhone market opportunity and nobody seems to have noticed," Hall wrote in a note to clients. Hall projects the new iPhone will grab 40% of the market in its price range, representing an additional 17 million iPhone sales in 2016. Hall's model shows the iPhone 5SE adding $6.9 billion in revenue and $2.8 billion in profit – good for an extra $0.43 in earnings per share. Multiplying that by the current price/earnings ratio of 11.3 adds about $5 to the Apple stock price. Of course, that doesn't figure in the much larger impact of the iPhone 7 expected in September. What's more, most analysts have also forgotten that Apple has another emerging market strategy that will begin to bear fruit at the end of this year. Remember the iPhone Upgrade Plan Apple launched last fall? People pay a monthly installment directly to Apple, earning the privilege to trade up to the latest and greatest after just one year. That will create a supply of almost-new larger-screen iPhones Apple can sell at a discount in markets like China and India. Both of these moves should help Apple gain market share while shepherding more customers into its ecosystem, where it can further monetize them by selling them apps and services. "There are still a lot of investors who view Apple as a products company when, in fact, it's now all about building a far more profitable services and infrastructure company," said Money Morning Chief Investment Strategist Keith Fitz-Gerald. "Any downdraft under the circumstances is an opportunity to add shares, especially if you have a longer term desire to safely and securely grow your money." Note that despite all the moaning from analysts over the past six months, the consensus AAPL stock price target is still $138, a 30% gain from the current Apple stock price. But Fitz-Gerald thinks even that's too low a target for AAPL stock. "I still think the stock is worth $200 a share," he said. "There's so much value locked up in that stock right now with Tim Cook trying to do what he's doing." The Bottom Line: Wall Street disregarded the introduction of the smaller, cheaper iPhone 5SE. But that's a mistake. The iPhone 5SE is part of a bigger, multi-pronged strategy to grow smartphone market share in emerging markets like China and India. This strategy, along with Apple's growing apps and services business, will help push AAPL stock as high as $200 over the next couple of years. I agree! With the opening of the China and India markets I one can see Apple at $200.00 … really it is worth that now.